Nicolaos M Kyvernitis Electronics Ent, the distributor of Clear – Com and HME in the Middle East, has recently supplied HME DX210 system to Prime Vision Studio that specialises in the art of photography and videography in the United Arab Emirates. The renowned studio has purchased HME DX210 system with six BP210 beltpacks and HS15 headsets. The wireless system provides the combination of outstanding sound clarity and ease of use. According to their requirements they have taken a complete set which consists of one BS210 base station with antennas, four BP210 beltpacks, five HS-15 headsets, battery charger, beltpacks pouches and the batteries. They added two extra BP210 beltpacks and HS15 headsets that allow seven people to use the system. DX210 supports up to 15 beltpacks or users. The DX210's interface is compatible with Clear-Com's 2-wire systems, and offers two separate 2-wire and 4-wire interconnections. Digital auto-nulling circuit allows users to eliminate the return audio of the wired 2-wire intercom automatically. The system offers 2-wire circuit protection to prevent feedback from un-terminated 2-wire channels. All DX Series systems are known for Spectrum-Friendly™ Technology to avoid frequency conflicts and Digital Frequency-Hopping Spread Spectrum technology for interference-free communication. Prime Vision Studio has been providing professional photography and videography services to a wide range of events and occasions across UAE since 2003. The company has stood against the test of time by the sheer staunchness and enthusiasm of the organization and nowadays is associated with the best of companies across all verticals including major Bollywood and Hollywood awards and functions. Prime Vision Studio’s recent purchase of DX210 system improves the communication within a team onsite during the big events such as Corporate Events, Product Shoots, Fashion Shows, Musical Concerts, Exhibitions or Sports Events. “HME Technology makes our job much easier than any other talkback technology due to its wireless system. During the events when it’s not easy to run the cables, DX210 system makes the two-way communication more accessible,” commented Mehboob Meghani, owner of Prime Vision Studio. 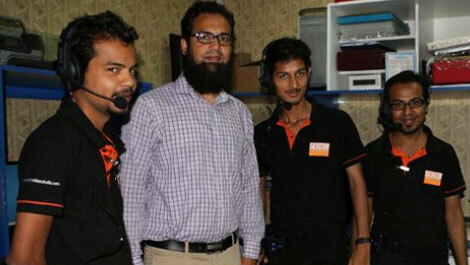 “We have chosen HME in order to walk with the innovative and update technology in the field of media,” he added.